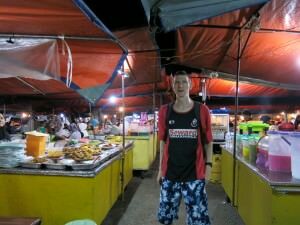 Rather than focus on a specific one type of food today, I decided I’d write about Kota Kinabalu night market in Malaysia, on the island of Borneo. If you’ve ever read any of my stuff on Taiwan, you’ll know I’m a big fan of night markets, especially the culture of it but also the money saving aspect. 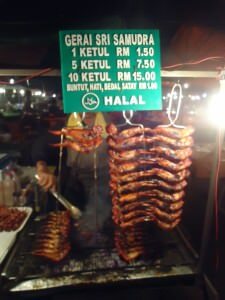 So I made a quick dash for the night market in Kota Kinabalu to sample some barbecued food! 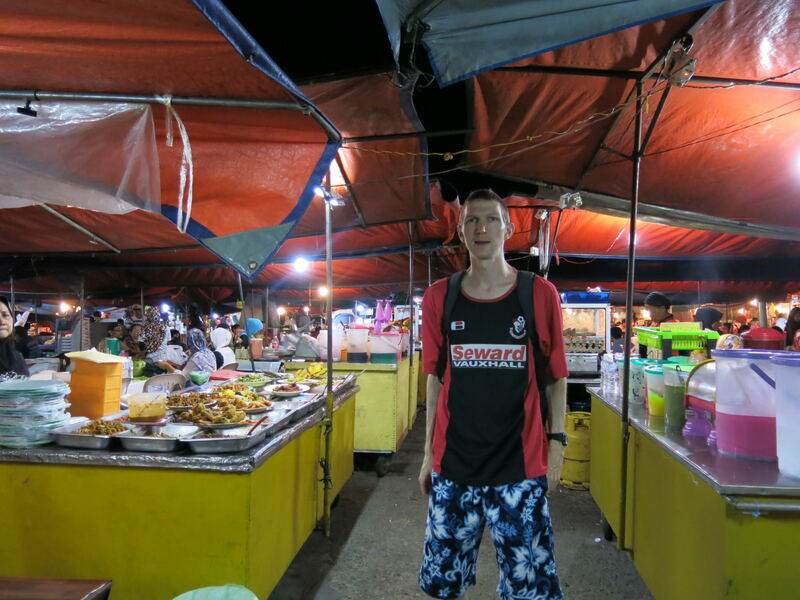 The seafront night market in Kota Kinabalu, Malaysia, island of Borneo. 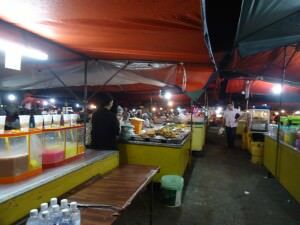 Where is Kota Kinabalu Night Market? It’s down by the seafront in Kota Kinabalu and is easy to find. Once inside, you will see a vast array of stalls serving food and drink! It’s open from early evening until just before midnight, though I’d recommend going there around 8-9pm for the best selection. 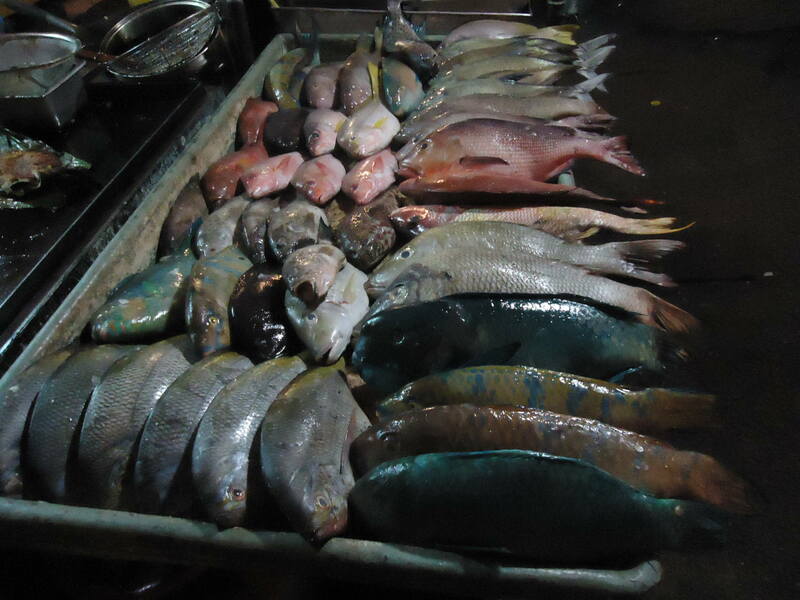 Fish at Kota Kinabalu night market in Malaysia. 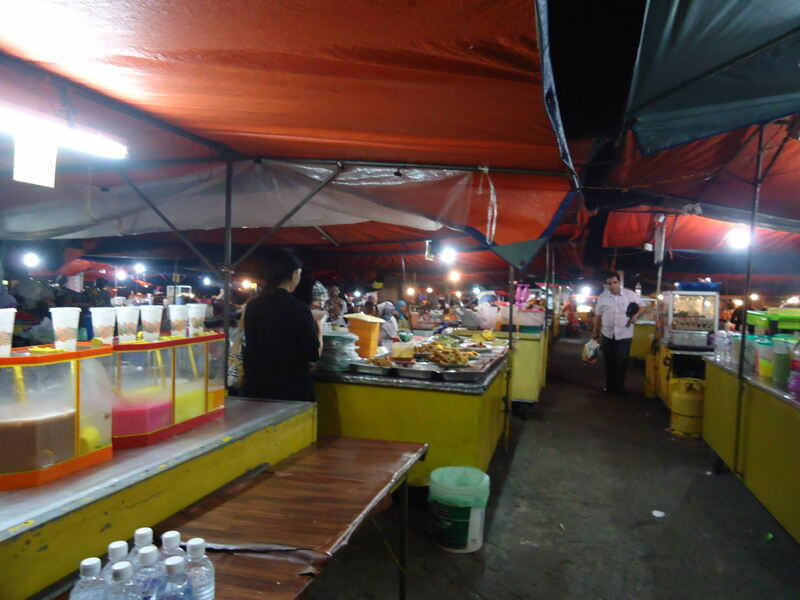 What type of food and drink is there at Kota Kinabalu Night Market? The meat will be mostly seafood, chicken and beef. It’s very rare to see pork in these parts as it’s predominantly Muslim. In terms of meals, loads of rice and curry meals are available. There’s also a decent range of fruit and vegetables. Yummy! I loved the barbecued spicy chicken at Kota Kinabalu Night Market, Malaysia. In terms of drinks, soft drinks, hot drinks and amazing fruit juices are all available. You can bring your own beer in if you want – I didn’t see any alcohol for sale inside the market, but the nearby streets have a load of bars on them! 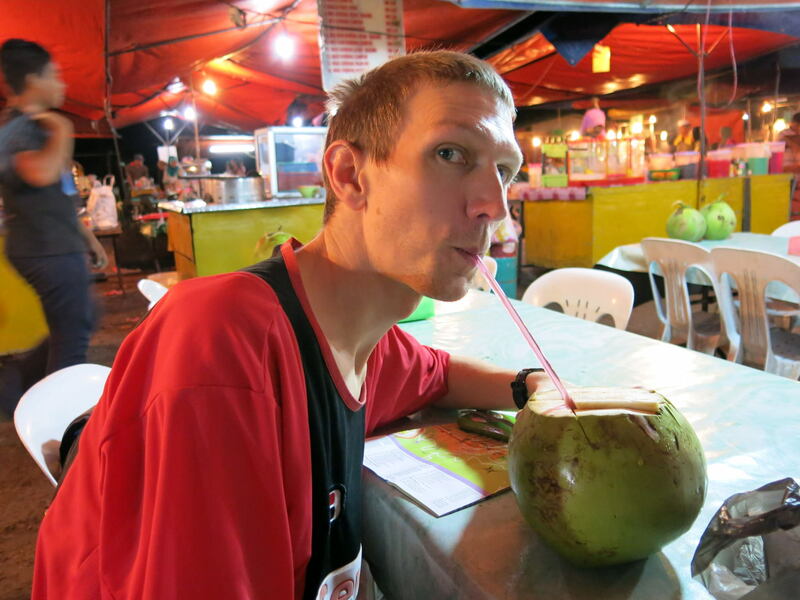 Sipping coconut juice in the night market in Kota Kinabalu, Malaysia. 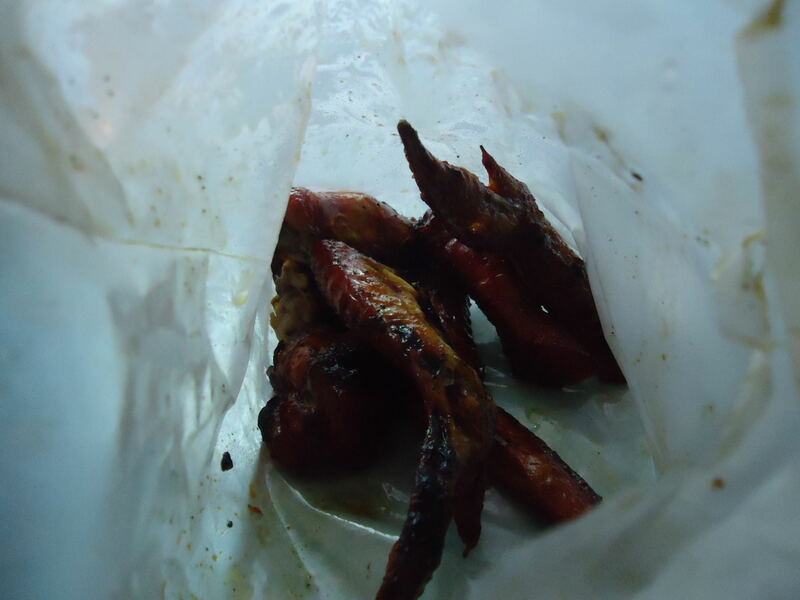 My top tip – Spicy barbecued chicken wings with coconut juice!! Absolutely delicious! This was a very recent trip of mine and I’m gagging to write more posts on Malaysia and Brunei, two of the countries I visited in Borneo, loving it! Friday’s Featured Food is an ongoing regular feature on Don’t Stop Living – a lifestyle of travel. If you have a meal, bar, pub, restaurant, brand or idea that you would like reviewed or featured on Friday’s Featured Food, please get in touch via my contacts page or my advertising page. I’d love to hear from you! I’d also love a free pint and a meal, or a coconut juice. Cheers! This entry was posted in Asia, Borneo, Daily Features, Friday's Featured Food, Kota Kinabalu, Malaysia, Sabah. Bookmark the permalink.